This is the one stop shop for all your eye care and contact lenses needs. The best thing about Contactlensesexpress.co.uk is that you can order your contact lenses here at an amazingly low price – as much as 70% below the retail prices. By ordering them online you save a lot of time and hassle. 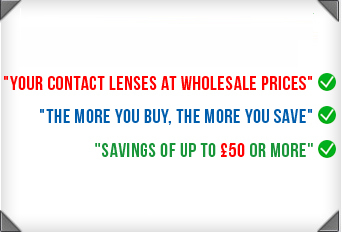 Select your choice of lens from the Contactlensesexpress.co.uk product pages. You can visit our online store and order your contact lenses according to taste and prescription. On our products page just select your choice of contact lens. In case you do not find the product of your choice on the list, just call our customer service team on 0800 037 4000 or email us at cs@cleuk.com. Alternatively you can use the Livechat option on our website. You will be guided on how to find the right product and place an order. So it’s important for you to realise that our proactive customer service is always available to you to meet your every need and to tackle any queries you may have instantly, to give you a trouble-free and enjoyable shopping experience. We do hope that you will have a great time shopping at Contactlensesexpress.co.uk.